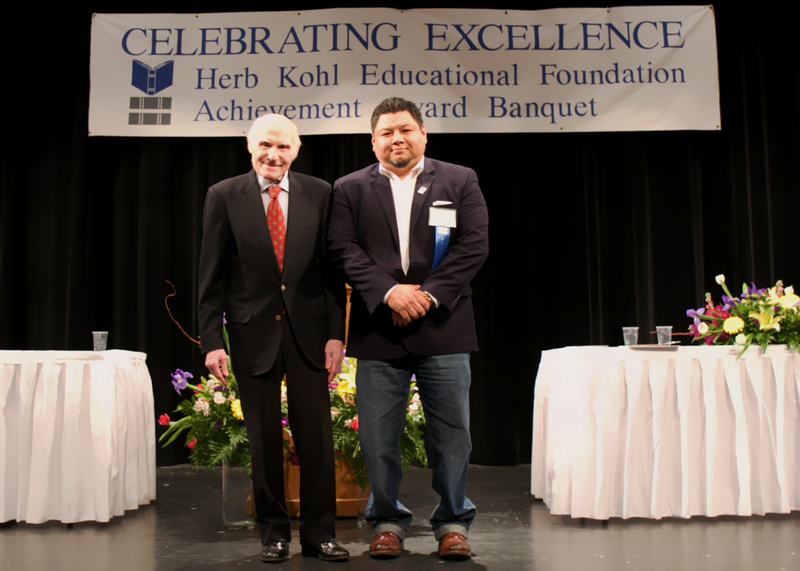 I am happy to announce that I will be one of six recipients of the Herb Kohl Educational Foundation 2018 Teacher Fellow from CESA 7. It took 7 years to get this honor. It is easy to lose hope after receiving rejection letters year after year from my district and foundation and to begin to doubt yourself if what you are doing inside and outside the classroom is being effective and impactful. I am so thankful to have colleagues that believe in what I do as an art educator and to see the impact it has on our school’s culture, our North High School community, and in the lives of our students. This is truly one of my career highlights. On April 28th, I attended a luncheon with other award recipients from across Wisconsin. A big thanks to my colleagues, Sylvia Cavanaugh and Tom Yedica; former principal, Jason Bull, and my associate principal, Rachel Biertzer and principal, John Matczak for their support. Excellence Scholarship, Fellowship, and Leadership Award recipients were selected by a statewide committee composed of civic leaders, and representatives of education-related associations and the program’s co-sponsors: The Wisconsin Newspaper Association Foundation, Wisconsin Department of Public Instruction, Wisconsin Council of Religious and Independent Schools (WCRIS), regional Cooperative Educational Service Agencies (CESAs), the Association of Wisconsin School Administrators, and the Wisconsin Parents Association. This fellowship is awarded to educators who are effective leaders that are an agent for positive change and superior ability to inspire love of learning. Click here to read press release (Sheboygan Press).